The essence of keeping your gym and fitness center looking its best goes without saying. Your fitness center or gym should be cozy and inviting with a welcoming atmosphere your members will love. It should inspire your customers to want to better their lives by visiting regularly to keep fit. At Pete’s Professional Painting & Power Washing, we use paint to make a difference in the life and space of our customers. Our commercial painting professionals are skilled and knowledgeable in paint and how best to use it. We only offer the best quality painting services, resulting in well-finished painting projects you can enjoy with your clients. 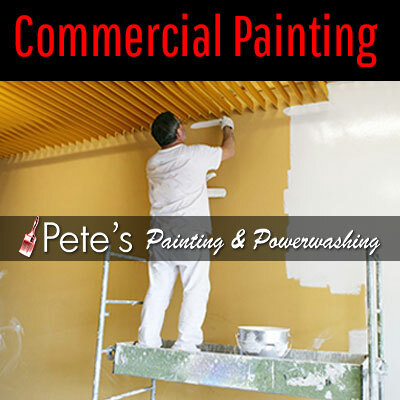 Why Pete’s Professional Painting & Power Washing for Commercial Painting Projects? Our professional painters use their expertise to deliver superior quality finishes, working on budget. They complete projects on time and clear the mess they create before leaving your fitness center spotless clean. Being a reliable and trustworthy brand, we work on at least five hundred projects every week across North America. Hallways are generally dark, hence need refreshing. You can use light colors on the ceiling and walls to reflect more light, brightening the hallway and making it appear more spacious. Paint the ceiling in a lighter hue than the walls to create the illusion of a more spacious hallway. Our residential and commercial painting projects come with a two-year warranty. We don’t just use Sherwin Williams & Benjamin Moore paints, but also select the best equipment to get the job done right.